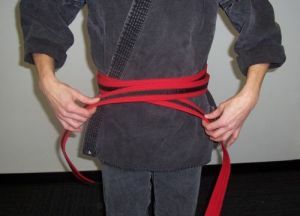 Follow the steps below to tie your karate belt. 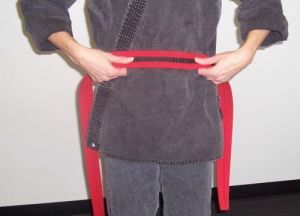 Step One Begin with the belt in front of you. 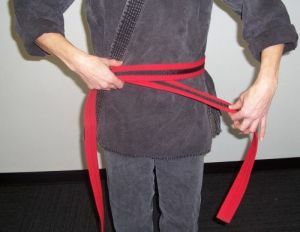 Place one end of the belt in front of your left leg (this is the end with the strips, if you have some on your belt). 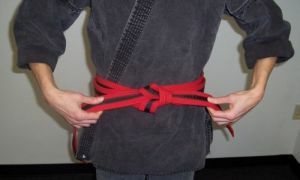 Step Two Bring the other end of the belt around your back and top of the first section. Step Three Wrap the same end around a second time. 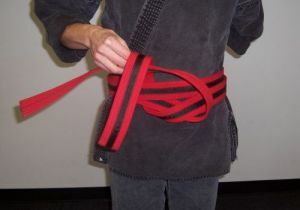 If your belt is VERY long, wrap it around a third time. 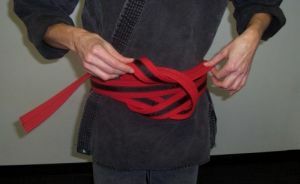 Step Four Take the end that has been wrapped around your body, and insert it underneath the center of your belt. It should pass under all the different layers, including the end hanging off your left. Step Five To begin the final knot, cross the end that is sticking out of the top OVER the end that has been hanging to the left. Step Six Take the end that is crossed on top and feed it through the loop. Step Seven Pull the ends to tighten the knot. Step Eight If tied correctly, the knot will have a piece on top, on the bottom, and on the left. Your stripes should end on the right side. 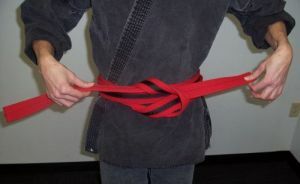 This article was posted in Kenpo Information and tagged karate belt, tie your karate belt. Bookmark the permalink. Follow comments with the RSS feed for this post.Post a Comment or leave a trackback: Trackback URL. 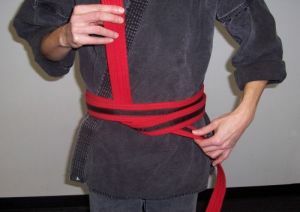 « What Does a Black Belt Really Mean?